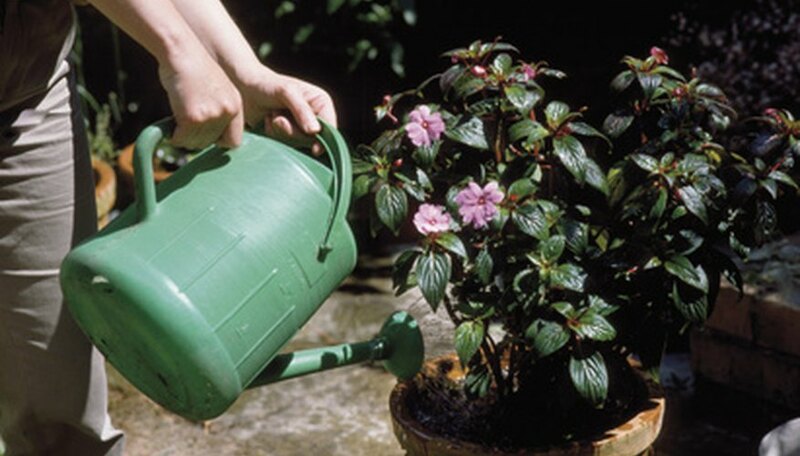 An easy way to increase the health of your plants is to add hydrogen peroxide to the water. Because it contains substantially more oxygen than water, peroxide provides more oxygen to plant roots. Peroxide also naturally fights off bacteria and fungus that can harm your plants. Take precautions when using hydrogen peroxide as it is a caustic substance that can be harmful in large amounts. Put on rubber gloves and safety goggles. Hydrogen peroxide can cause irritation if it gets in your eyes or sits on your skin for too long. Pour 1 gallon of water into a bucket or large pot. Add 2 tbsp. of 35 percent food grade hydrogen peroxide and mix it up with your hand. Food grade peroxide is much more stable than the common 3 percent hydrogen peroxide. Also, 3 percent hydrogen peroxide has added chemicals that may not be good for your plants. Pour the mixture into a watering pot and water normally. Store unused portions of the liquid in a bucket or jar.